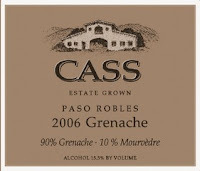 This Paso Robles estate grown Grenache is composed of 90% Grenache and 10% Mourvedre. Cass Vineyards and Winery is located between Paso Robles and Creston on California's Central Coast. The tech data wasn't available on the winery website so we'll have to assume this wine was aged in oak for some time although I'm not sure what kind. Right off the bat I notice that this wine has very powerful aromas of oak, so much so that it almost comes across as coconut creme. Other aromas that I noticed were prune, plum, dates, molasses, and tobacco. Wow, guess you didn't like that one too much. Too bad I've heard it's a wine that Cass Winery consistently sells out of long before the next vintage is available and one that another Internet wine blogger James the Wine Guy gave 90 points...guess everyone has different tastes! Absolutely everyone has different taste. I may have had a bad bottle too even though it seemed like a pretty bad attempt at Grenache even is it were corked or cooked. Thanks for the comment! Cheers!